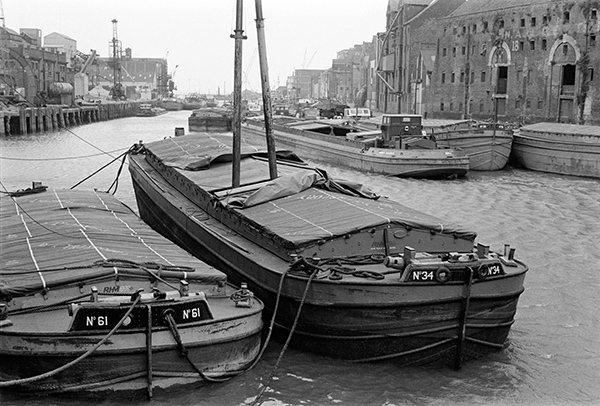 This was the River Hull from Drypool Bridge back in 1977, in what was known as the Old Harbour, in use from before Hull had docks, and still in use in 1977. Those barges in the foreground were moored in front of Rank’s Clarence Mill, one of Hull’s great landmarks, rebuilt after being almost completely destroyed in the war. That same waterfront, seen looking upriver towards where I took the earlier picture in February this year is rather different. There are only two vessels moored and one of those is the museum ship Artic Corsair, Hull’s last surviving sidewinder trawler, bought by the council in 1993 and now occasionally opened to the public. The other at right is the Dovedale, built as an inland tanker in 1962 that has clearly seen better days. There are three new bridges across the Hull, two of them footbridges and the other carrying the heavy traffic of the A63, including much going to and from Hull’s King George V dock, as well as a tidal barrier. 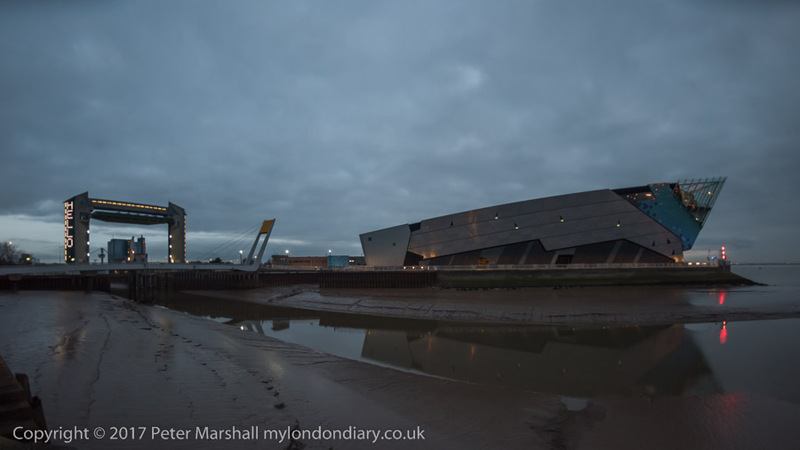 And past the tidal barrier at the mouth of the river is of course now The Deep, a major visitor attraction. The message on the side of the Tidal Barrier was an art installation which enabled people to put up their slowly scrolling messages on it. Hull has always suffered from flooding, with much of the area being very close to sea level and reclaimed from marshland. 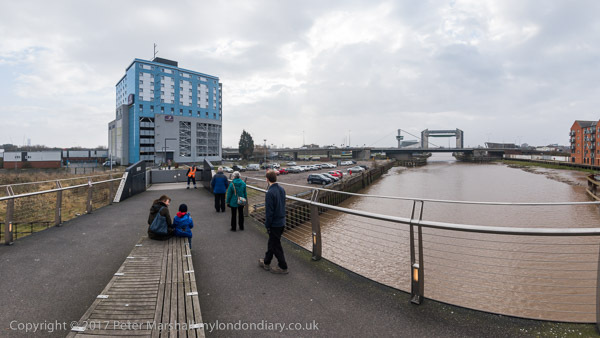 The tidal barrier keeps out tidal flooding, but the dramatic floods in the summer of 2007 in which almost 8,000 homes were flooded and 1300 businesses effected came from heavy inland rainfall converging on the area and swamping the rivers and drains. A day later I joined around twenty other people for a ride on the most recent bridge, the footbridge at Scale Lane, which was designed to allow people to be on it while it swings around through about 90 degrees to leave the river clear. 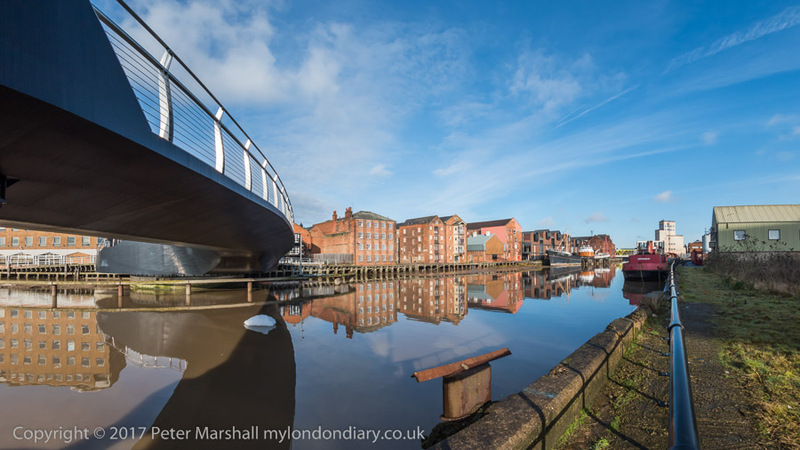 Of course with little or no river traffic, there is seldom a real need for the bridge to open, but it still has to be able to open – along with the other bridges across the River Hull – if a vessel requests passage. 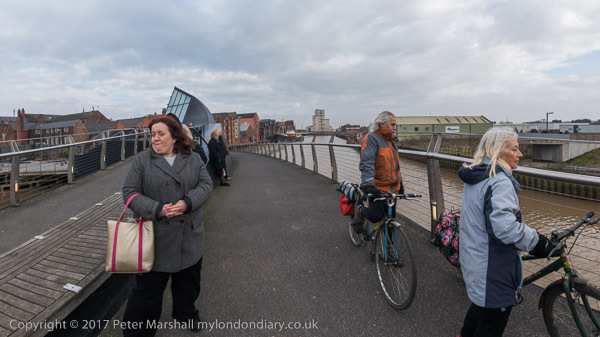 Last week in an art event as part of Hull2017, all 13 bridges between East and West Hull were opened together for a minute at the Autumn Equinox (or technically around 45 minutes before it), splitting the city in two. There is considerable rivalry between the two halves and some Hull residents would like the opening to be permanent – and one listed bridge has been open permanently since 1994. The bridge rotates around an axis close to the west bank of the river, where a curved walkway remains in contact with the land, but the other end swings out across the river, with gates on the approach and on the bridge itself being closed seconds before the bridge begins to open. It then moves slowly and steadily, fully opening in a minute or so before moving back and into position again. It isn’t exactly a thrilling ride, but interesting and free and once or twice a week (times on the Hull corporation web site) makes sure that the bridge will still work. This entry was posted on Tuesday, September 26th, 2017 at 09:49 am and is filed under Hull Photos, My Own Work. You can follow any responses to this entry through the RSS 2.0 feed. You can leave a response, or trackback from your own site.